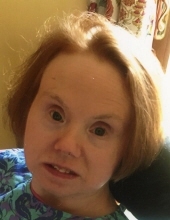 Anne Marie Haas, age 50, of Council Bluffs, passed away February 9, 2019. Preceded by parents, Kermit and Helen (O’Connell) Haas and brother, John. Anne was a life-long resident of Council Bluffs graduating from Thomas Jefferson High School in 1988. She worked at VODEC. Anne treasured family and friends. She loved life; from parties and holidays, to gift giving and extending thoughtful gestures. Her love of music led her to her love of dancing. Anne was a true blessing and will be missed beyond measure. She is survived by 3 brothers, Tom (Sabra Ann), Jim (Kelly), and Chuck; 6 sisters, Christine (Jack) Daley, Carol (Jim) Weddle, Mary Haas, Margaret (Victor) Hurtado, Patty (John) Jurgensen, and Jeanne (Scott) Brown; many loving aunts, uncles, cousins, nieces, nephews and friends. The family would like to thank the staff at Mercy Hospital for their care and compassion. Additional thanks to the home healthcare providers, especially Teena Robertson, a blessing to all. To send flowers or a remembrance gift to the family of Anne Marie Haas, please visit our Tribute Store. "Email Address" would like to share the life celebration of Anne Marie Haas. Click on the "link" to go to share a favorite memory or leave a condolence message for the family.